7 Places that you can’t miss out in Delhi. – All About India ! 7 Places that you can’t miss out in Delhi. A place where unity in diversity is proven amongst diversified cultures and religions of India. People enjoy a blasting set of cultural programmes varying from western to niche local traditional folks.The place has its own eating joints inside. Visitors have the choice to eat pure American cuisine at “All American Diner ” & a wide variety, classy food court “Eatopia” serving you one of the finest Dal makhni & laccha parantha in the town. Nearest metro station- Jawahar Lal nehru Statidum. TIP- If you still wonder about the “Rang De Basanti” amphitheatre, here it was ! Favourite place amongst delhi’s youngsters and love birds. Get your favourite brand of booze at the lowest price all around Delhi. I must say this place is “real pocket-friendly” one. You could find again the numerous types of cuisines here at different spots like “RAASTA”,” Lord of Drinks Meadow” & a lot more. Nearest metro station- Hauz Khas. A holy place build by great effort of HH Pramukh Swami Maharaj,defining Hindu culture. This place is truly the greatest innovation in hindu culture where one could learn and preach religion through multiple activities like a spiritual movie @ DOME theatre , Indoor Boat ride sailing you through the deep and hidden theories of India & robotic plays spreading words from the holy books and veda’s. The best part about this place is, you can have a deemed valuable time at very low price on a real sunny day. All activities are air-conditioned and indoor. The sacred temple is located onto a floor bed of over 100 acres near the enchanted river Yamuna. Nearest metro station- Yamuna Bank. TIP- Spare a day and visit this place with full relaxation. The food is really great inside at unbelievable cheap prices. This market place is one of the oldest commercial space in the town successfully rushing till now. In other words, this place is home to a lot of luxury brands at a very cheaper price. Games,accesories, clothes is all that you get here at one stop. To all those female readers, get ready and pick up your shopping bags. Michael kors,Louis vuitton,GUCCI could be bought at nominal prices. P.S- Sorry guys for making you suffer with empty wallets soon.GO GIRLS ! Nearest metro station- Rajiv chowk. TIP- Never think that the price offered at first place by any shopkeeper is ideal. This could be heaven for BARGAINERS. The Chandni Chowk is one of the oldest and busiest markets in Delhi.The place comes under Old Delhi near to railway station. The market is enlightened by The Red fort. This place has a mughal touch with a very strong bond between hindu & muslim. “Bazaar” is what embraces this place. Market(Bazaar) is the hub to one of the oldest, biggest & richest retailers of India. The place has a lot to wander, shop and EAT ! Kuremal Mohanlal Kulfi wala , Gali paranthe wali , a lot more. Nearest metro station- Chandni chowk. 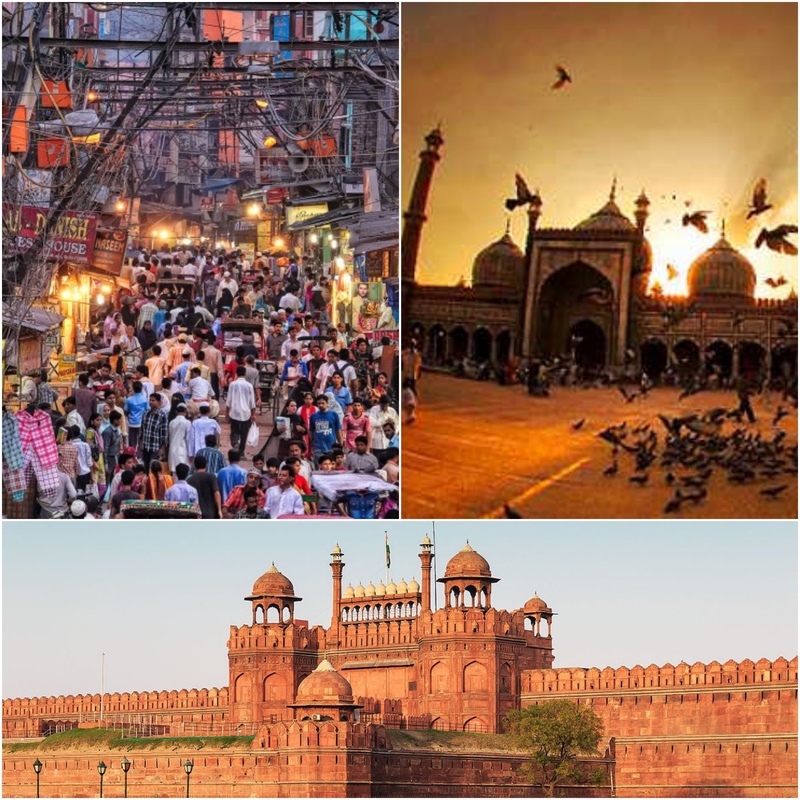 TIP- Don’t miss out the historical mosque “JAMA MASJID” as well as “The Red Fort”. There is also a historical Digamber Jain temple right infront of fort. Looking for a day to be spent well? oh my friend here you go. Lavish cafe’s to shopping spots with a wide variety of brands and movie theatres is what you get as a package at this place. Old circle with symmetrical and identical buildings and park make you go crazy when weather is with you. “Janpath ” is one of the hot spots for people to go around CP. Family,friends,couples,it fits to all peeps. Depauls- cold coffee & snacks. Here you get to go with three different malls with all brands possessed in just one row. Don’t worry about travelling to another place to find another brand. Just easily strike your feet to the ground and walk a couple of steps to the entry of adjacent mall. From cheapest brand to one of the finest luxury brands of the world is all what is waiting for you. TIP- Have fun with segway at the passage between Promenade and Ambience.